This program fully covers the College Board’s AP® biology Curriculum Framework and is supported by a wealth of teacher and student materials. The authors have focused on the key content and supported it with clear explanations and effective figures. Offers AP-specific chapter level features that clearly correlate the textbook’s content to the AP® Curriculum Framework and prepare students for AP Exam success. 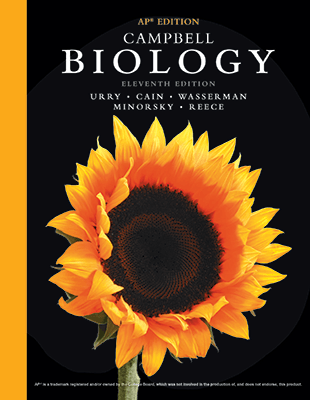 Delivers a streamlined, 900-page text that emphasizes the essential content and scientific skills necessary for success in the AP® biology course. Presents core content required for the course, while retaining the clear explanations and figures that support the student. Highlights five basic themes that run through all areas of biology: evolution, energy and matter, information, interactions, and organization. Presents a novel approach to studying the evolutionary history of biodiversity (Unit 4). Each chapter focuses on one or a few major steps in the history of life. The coverage of natural history and biological diversity emphasizes the evolutionary process. Features Scientific Skills Exercises that support the Framework’s Science Practices as students master data analysis, graphing, experimental design, and math skills. 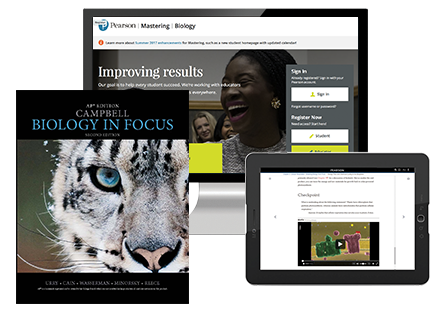 Learn more about Pearson's Campbell Biology program, Test Prep for AP and Mastering. This Test Prep Workbook for AP® Biology is designed to support the AP® Biology Curriculum Framework. Each chapter reviews content that is Essential Knowledge and makes connections to the Framework. Material that may be used as Illustrative Examples is included and clearly distinguished from the required content. This workbook will help students become familiar with the Big Ideas, apply the Science Practices, gain insight into the AP® labs, and prepare for the AP® Exam with practice tests. In addition to its student friendly features—You Must Know boxes, Tip From the Readers boxes, and practice problems—the workbook now integrates Science Practices throughout and includes an emphasis on making connections between topics.